Woot! Promotion! On to Vanarama National League! We ended up clinching the league championship with two games to go. We won three and tied one of our next four games, including an 87th minute goal in a 1-0 victory over the second place team Harrogate. We then completely fell apart and lost our last two meaningless games. 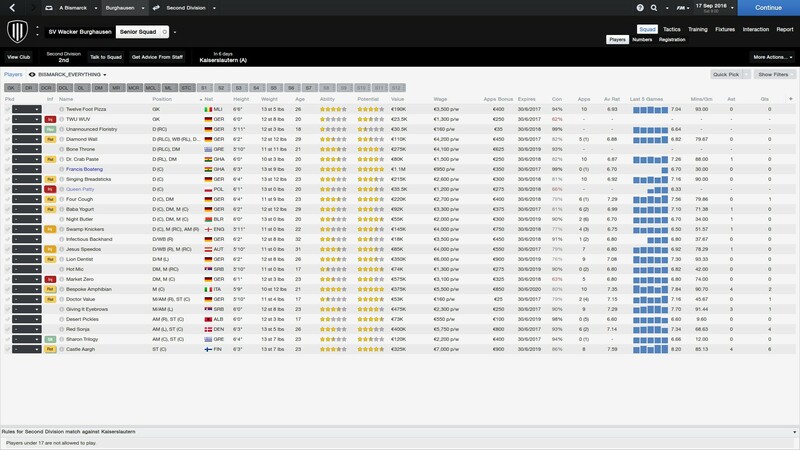 I've got no clue how to manage the league transition in terms of salaries, star ratings, quality of players needed, etc. I got a new one-year deal with Telfford, for 44.5k, and got them to nudge up our salary expenditure, which will be around 800k, including transfer funds. That'll be nearly double that of this season. My rough plan is to resign the top half of the team, most of whom are scouted as having National League potential. As we head into the middle of May, I've got most of my targets in that group locked in for next year already. Notably, however, I pissed off Kasheme Walton, our best striker, with my first round of contract negotiations, and he's not willing to re-enter negotiations yet. A couple of other players I'd like to keep are angry at me about playing time and unwilling to resign, but whatever, we'll drive on. I've got the better players from our team locked in for about 300k, and now it's time to go shopping for some quality National League players. Lots of things to do! The change in tactics has gone rather well for us. We lost 0-1 away to Hertha in our last game in 4-1-4-1 and then came from behind to get a 2-2 with Paderborn in our first game with two forwards. This has put us second in the league after 9 games, behind the only team to beat us in the league - Hertha. We also have the best goal difference at +12, although Union Berlin look fun to watch with 25 goals for and 16 against in 9 games. Bespoke Amphibian has continued to be great, but breakout star is really the new Forward Castle Aargh, who's chipped in with six goals and four assists in seven league games. Interest in Twelve Foot Pizza has waned, but he's also asking for seven grand a week to extend his contract, so he'll probably be gone next year unless we somehow get promoted. I think fifth place is worth about €5,000,000, so if we can finish up there and no one snags him on a pre-contract between January and June then we have a shot, but he's listed as "ambitious", so I expect he'll be gone. Drama in Berghausen last night as Twelve Foot Pizza broke his shoulder in training. Doubly bad news as back up keeper Twu Wuv has been out of action since the pre-season with a slipped disc in his back. Fortunately the Mali manager still called Twelve Foot Pizza up for international duty meaning I had four players out representing their countries which is the threshold for requesting a match postponement in Germany, so I had to deal with one game less with no keepers. I had to throw a 17 year old in goal for his first ever professional appearance and it was easy to choose which of the three youth kids to pick as this guy had practically nicknamed himself - Tobias Bergers. The very first shot he faced arrowed by him from 20 yards before he could even move and then ten minutes later a shot hit directly at him seemed to bounce off his shoulder and in and we were 0-2 down. We were being overrun, but right on the stroke of halftime Bespoke Amphibian lofted a beautiful chip from the angle of the penalty area over the keeper into the far side of the net to give us some hope and then Castle Aargh tapped in on 65 minutes to bring us back to 2-2. Having come back from two goals down I was happy to try to sit on that result and take a point for the draw. On 92 minutes Berlin won a corner, then won the header from the cross and the ball beat Burgers, but doinked back off the post. We punted it up the field to try to burn out the rest of the clock, and the ball got to winger Giving It Eyebrows who paused, the rolled the ball square across midfield about 35 yards out. Swamp Knickers had never scored for us before. Whoa, that's one heck of a shot! And couldn't have been more dramatic timing either. That's got to feel good. With that kind of a shot, how could he not have scored before? This guy needs to get himself a personal chef. I haven't had a chance to play this week. Work, life, super busy. I don't really understand what's happening any more. My Dad was a Formula 1 mechanic and he'd say "everyone knows why they're slow. Nobody knows why they're fast" and that seems to fit, because I'm putting out a sensible XI every week, but it features one MC, one DC and one MR that are serious question marks that I would really like to replace and then the team absolutely wrecks face while I sit in my office chair drinking a cup of tea trying not to upset anyone. I mean, the obvious thing to say is that we're being carried by this guy, who's an absolute f*cking monster. 16 goals in 15 games... Scored in 12 of his last 13 appearances. Plus six assists and six Man of the Match awards. We got him for free on a one year deal and as soon as I saw him play twice I threw another contract at him to hold him at the club to 2019. Bespoke Amphibian is also signed through 2019 and it's beginning to feel like I could just put those two out. Amphibian takes all the free kicks and corners and Aargh then scores from them. When I play my 4-1-4-1 system Aargh is the lone forward and Red Sonja goes back to the bench, but when I do play with two up front they really play well together - Sonja has eight goals in 10(5) appearances too. Best of all, Aargh got called back to the Finnish national team for the first time in a couple years and promptly scored his first international goal, then gave me all the credit for helping him relaunch his career and now I show up on his favoured personnel. 25 years I've been involved with this series now - whenever things start going this well I get very, very suspicious. Nice run! Confidence is contagious. When I got on a good run like that last season, I always got nervous with my pre-game/halftime/post-game pep talks that I was going to screw something up and wreck the team's sky high morale. Then they'd lose and start a downward morale spiral that would see the team quickly fall apart. May & June prove hectic, as we prepare for our first season in the Vanarama National League. We start by trying to resign the players from our existing team who we think can play effectively in the higher competition of the National League. In the end, we end up inking deals with 11 members of last year's senior team for the trip up to the next league. 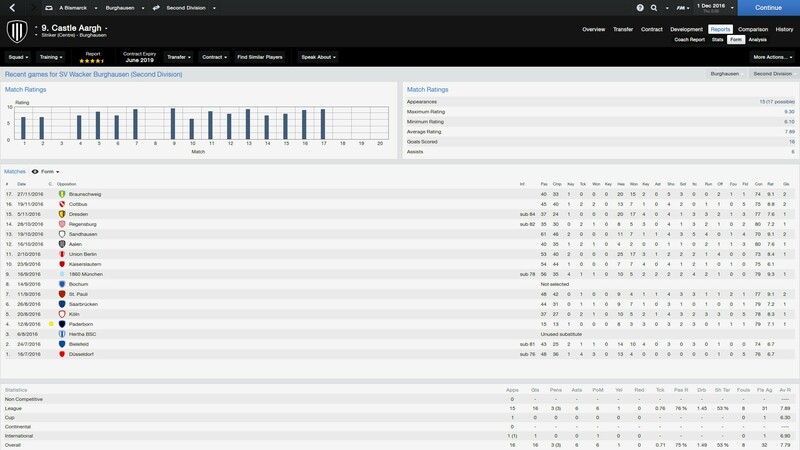 In particular, I was happy to sign Kasheme Walton, who was selected Player of the Season in the Vanarama North League last year, and led the league in goals and game rating. We also had Jak McCourt, our second-best player from last year's team and runner up to Walton for league Player of the Year, fall into our lap. McCourt was on loan from a Sky Bet League 2 team, and when I tried to sign him in May while he was still on contract it would have cost us over 250k. (Our board's limit is about 60k per player.) I pretty much gave up, but his contract expired on June 30, and when we went back to him he was now only asking 50k per season. There were a bunch of teams courting him, so I offered him exactly what he was asking for without negotiating. I still thought it was a longshot, but Jak apparently had a good time playing for us last year and inked a two-year deal after a week's deliberation. He'll be a solid addition to our midfield. With those 11 players in place, we started going trying to fill key holes with loans. We brought in some strong central defenders and a couple of midfielders to help shore up our spine. With four loaners in, we moved to free agent signings. We brought in some high potential, young players to reinforce some odds and ends, and then added another 3-4 backup role players as our first friendly draws near. On the cusp of our first friendly, I feel like we're for the most part in decent shape. I like our spine, and am excited to see how some of our new signings pan out. We still need players at CB, ML, and DM, but they're mainly for bench depth than they are for key roles. I'm sure, however, that several of our players making the move up a division will struggle, so I'm guessing I'll be still making moves well into the fall. Financially, I really like how we're sitting. We've used about 500k out of 800k to sign our existing players, which still leaves a solid amount of cash to backfill any weaknesses that pop up as we learn the ropes against tougher competition. Our preseason friendlies are a mix of optimism and disappointment. At times we look capable of playing exciting attacking soccer. At times we make critical errors and stupid giveaways. In all we play five friendlies, winning three against easier opposition and losing two to better opposition. At a minimum it's clear that we'll be facing stiffer competition than we did last year. Our stellar performers from last year will in all likelihood not shine as brightly. We don't add any significant players during the preseason either. I tried to land a striker and add some depth to our central defenders, but nothing particularly enticing worked out. We did land an attractive Iranian striker with a big upside, but work permit difficulties ended that signing. I'm still trying to work a few deals out, but I'm inclined to hold off until something really outstanding presents itself. So with our opening match less than a week away, it looks like we'll head into the season with the following roster. Once again, we have an extremely young squad with room for development at almost every position. I'm hopeful we can hold our ground in the first half of the season as we develop teamwork and chemistry, then move up the table in the second half as our players develop and master our system. I got frightened by your wages there for a second, but those are all per year, right? Yeah, those are per annum. It's such a funny little difference, I'm so used to calculating wages per year, despite the fact that, in a "living every day" sense, calculating them per week makes far more sense (The difference between $40K a year and $50K a year can be kind of nebulous and abstract, but if you told me I could go from making $750 a week to $850 a week, suddenly it's MUCH more clear). What are everybody's bogey teams in FM? In my mostly England-focused playthroughs, beating Mourinho's ManU and Pochettino's Tottenham took absolutely herculean efforts. In my Germany game, Bayern actually weren't that bad, it was just that getting the ball past Neuer was SO FREAKING HARD. Has anyone else noticed that about the top goalkeepers in FM, by the way? Like, Lloris, De Gea, Neuer, Navas, Buffon and Courtious are near-impossible to score against. I've literally had games where I won 2-1, despite the fact that my world-class attackers had 4 or 5 clear cut chances and just as many half chances, because one of those keepers was going absolutely berzerk and stopping everything (and still somehow ending up with a rating of 6.8, despite stopping like 15 shots). I used to use weekly wages. I started this career with yearly by mistake. Then I realized that I liked it better. I feel like it removes a math step when integrating it into all the other financials. I tried returning to weekly but then I switched it back to yearly and have just run with it. I've been away from the game for so long that I don't have any teams that I'd categorize as bogey teams yet. I'm sure a couple will rise out of the crowd, but I think we won at least once against every team last year. And down in Vanarama National North for the first two seasons, pretty much every keeper was easy to score on providing the shooter could get the ball on frame. The shooting down there was atrocious though. So many shots that miss by a mile! This year, playing up a league, I can notice the improvement already. Most teams seem to have a couple of guys who can consistently force the keeper to prove his worth. Our first month of competition in the Vanarama National League is a modest success. We tie two away matches and pick up victories in our two home matches. We end the month in 4th place, just two points off the top spot in the league. Our hero is striker George Miller, a late loan signing who wasn't on the roster as the season started. He starts our second game and blasts home three goals, then picks up another goal for us in a 1-1 away tie in our third match. After three starts he has four goals and two man of the match awards. His powerful shot and accuracy are a cut above our current strikers. Although it's crazy to assume anything after four matches, it does appear that we have a squad that can compete at this level. We seem to lack cohesion and we're making costly mistakes on defense, but at times our attacking play looks creative and powerful. We'll hope to build on our first month as we head into September. On the back of yet another absurdist performance by Leo Messi today, I am struck by how I don't think I've ever seen a FM game manage to model his (and Ronaldo's) absolute scoring dominance. Whether that's down to how the AI managers use them (a large part, I think) or the game's mechanics (a smaller, but still significant part), I'm not entirely sure. Kee-flipping-rist Non League football. Worcester City just had our fifth game of the season postponed due to a waterlogged pitch. And, it seems that the quality of our pitch can be summarized as "Verdun, circa May 1916". But! That did come to our assistance in a historic way. We got an incredibly lucky draw in the qualifying rounds of the FA Cup, defeating Rushall Olympic, Bamber Bridge, and Kings Lynn Town to get into the FA Cup proper. Then, in the 1st Round, we beat Dag & Red 2-1, followed by a win over Maidstone United 2-0 in the 2nd Round. Now, naturally, I assumed that our journey was over. The FA Cup 3rd Round for a National League North team is fantastic, plus, we were drawn at home, which meant a near-guaranteed sellout as we'd be taking on Champions League opposition. Now, Tottenham probably took one look at our pitch, decided they were far more interested in the CL and didn't want to risk Harry Kane tearing a ligament trying to run across our field, so they sent a team comprised of U-23s, U-18s.... and Kieran Trippier, for some reason. Now, I still had us losing this one, but from the opening whistle, the boys went at Tottenham like they'd stolen something from us. A huge slice of luck comes on 20 minutes, when our CM's free kick takes a mighty deflection and ends up in the bottom corner of the net. 1-0. Four minutes later, our right back floats a cross into the box, that gets headed away, where one of my two strikers, arriving late, absolutely blooters it into the back of the net. 2-0, and I am in literal shock. Five minutes later, Nick Tsaroulla decides to register his extreme disappointment with the quality of our stadium by launching himself, two-footed, into my left winger. Straight red, and suddenly, it's little Worcester City up 2-0 on flipping Tottenham, up a man, with 60 minutes to play. Then, just before the half, Michael Vorm makes a complete hash of a simple header, spilling it, where their Center back attempts to clear it, ends up biffing it off of our striker's face and into the Tottenham net. 3-0! 3-freaking-0 is how it finished. 3-0. We beat Tottenham, not just beat them, won THREE-NIL in the FA Cup. Scenes at the Victoria Ground. Absolute scenes. EDIT: Oh, and a follow-up Q for all my fellow managers: I think we all know now that the AI "learns" your tactics, so coming at it with the exact same 4-4-2 you lined up with the last time you played won't give you as good a result as the first time (usually), and radically changing tactics from for a reverse fixture can be a huge benefit (playing a 4-4-2 in the away fixture, and a 4-2-3-1 in the return fixture, for example). But chopping and changing tactics too often can lead to disjointed performances. So my question is, how do you all keep the AI guessing? How do you prevent your favored tactic from going stale? Do you just choose a single way that works and ride it until it dies, or are you (like me) a tinkerman? Or do you make some more, subtle tweaks to your preferred tactic? 1068 club goals in 914 appearances isn't too shabby. I remember he wasn't even supposed to be a starter for me in his first season but whoever I had splashed the cash on to play up top wasn't scoring at all and he was, so he got the job. That Everton file was one of my "new version of FM out but I don't want to buy it at full price so I'll vacation as a holiday manager for one year before adding a new manager to a club that looks interesting." I don't remember what it was about Everton but usually when I take over a premier league side when doing that they're outside Europe and had a really bad season. Bloody hell Prederick, that is a result. I... stick with one tactic. If I'm a smaller side I might set up a defensive tactic for really difficult matches or when protecting a lead but I'm Jurgen Klopp - I have my way to play and that's how we'll be doing it week in and week out. Grats on the win against Tottenham! That's impressive stuff. I am a believer in catching the AI teams off guard with a variety of tactics and formations, but I try to guard against confusing my own players. Down in the bowels of semi-professional football they can only handle so much. For the past two years I've been running two formations: a 3-1-4-2 DM formation for 70% of our matches and a 4-4-2 for 30% of our matches. When I play one or the other depends on a ton of things like fatigue, opponent level, home/away, number of consecutive times I've run one formation, previous string of results, etc. Our 4-4-2 is more defensively secure so I tend to like that formation when we're facing something better than our own team or if we're away against equal opposition. The 3-1-4-2 DM formation seems to generate more quality chances. We often control the center of the pitch very well with it, and can consistently stuff the ball back down the other team's throats with our DM picking up a lot of clearances from the opposing defenders. We do give up control on the edges with it, however, so once I see teams start to zip in crosses from the wings and play the ball consistently wide to wingers, I tend to switch to a 4-4-2 to mess them up. In our current season, however, our best LB is really struggling (6.4 rating). He's got a big upside, so I'd like to just take the hit now while he develops, but I'm not sure he's getting enough time on the pitch to develop. So it's an issue to solve, and has kept me away from the 4-4-2 except for a couple of games. I'm also considering using a 3-5-2 formation, as I've got a glut of good CMs. For the past three years the team has been training in that formation as much as the others. I've just never used it yet. I play 4-1-4-1 and 4-4-2 right now, but if I remember rightly it has been a decade since the AI directly cracked a tactic making it unusable. I think around the 08 version they instead started figuring out where the gaps where in your system and then they try to put their players in those gaps. The end result is similar but less dramatic than a tactic just outright stopping working. Back around the 06 day I built one 4-4-2 and then adjusted the position sliders one click forward for everyone and saved that as +1 and then backward as -1 and so on. I'd have tactics in each direction in a -4/+4 range and switch based on game situation. They also counted as different tactics, so the AI didn't crack any of them in more than a decade in game time. Now that familiarity is more obviously presented and you can only really have three tactics I've gone away from that, but I still have "sets" of player instructions that are designed to subtly alter the way the team is positioning within the same formation. I also play with my fullbacks as to which stays back and which goes forward and then whether that first fullback is on Attack or Support. I'll also sometimes tell my wingers to "stay further forward", although I try to stay away from individual instructions entirely in the lower leagues. These little changes all seem to add up to making it hard for the AI to work out what's happening. Yeah, I switch around those playing roles all the time, mostly depending on who can do what. September is a packed month of eight matches for us. While things never feel comfortable, the month is a strong success. We win four and draw four to head into October in third place, four points back of first place Stevenage. Through eleven matches, we've won five and tied six, and are one of two teams to still be undefeated. The high point of the month is undoubtedly a 6-1 away thrashing of a plummeting Eastleigh. Not to say that things have been easy. By the end of the first week of September, three of our senior squad strikers were out with injuries. Ben House, arguably our second best striker, is down for 3-4 months with a torn hamstring. For one match, we had to call up two strikers from our U23 team and start one of them. 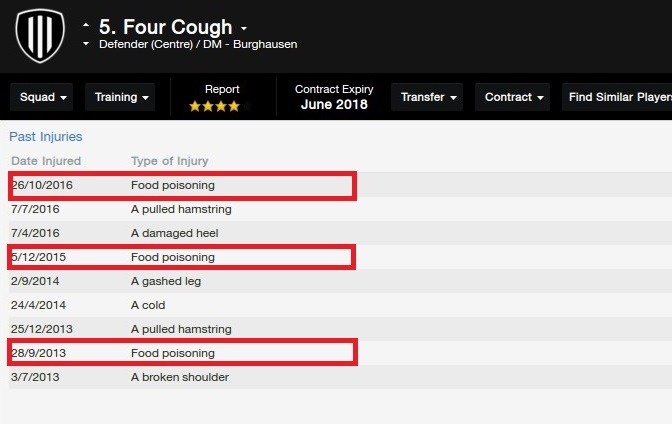 Although most of the injuries weren't serious, we get dinged up at a number of other positions and go through the whole month without having our best eleven starting any given match. From a news standpoint, we jump on a transfer listing for a disgruntled Sky Bet League One midfielder named Josh Laurent, and make him the club's most expensive transfer signing ever. We drop 27k to buy him, then ink him to a 44k deal for two years. He can play both DM and CM, and has perhaps the greatest potential of any player on our team. He should add depth to our already strong midfield, and give us options at DM that we simply didn't have. As we head into October, we're hopeful to keep up the good run. At the moment we're in the playoff zone of four teams, which would be a fantastic place to stay. I'm nowhere near optimistic, though, that we can do that. 1068 club goals in 914 appearances isn't too shabby. Ye GODS. How many Ballon d'Ors did he win? Oh Godzilla Blitz, you're tempting me with starting a lower league FM16 game. The retirement blurb said 15, and it looks like he won 14 in a row. He never seemed particularly electric watching him in the match engine but boy was he effective. He more or less just got free in the box a lot and scored goals. I had a game where I ended up becoming Bayern Munich manager and went about 3 league seasons undefeated in large part due a Turkish striker I forget the name of, but he was able rack up Messi/Ronaldo levels of goals. It's also the only ever time I've managed a double hat-trick in a game, and it was scored by Toni Kroos, I think there's actually an achievement for it! Weirdly enough in that game, I don't think I managed to win the Champions League. I remember Genoa won it the season before and I played them in the semi final, winning the home leg 8-0. Got to the final against 4th league place Man City and lost 2-1! Pure FM that is. It felt like an unrepeatable case of catching lightning in a bottle, but after taking three years to get out of Division Three, we made it out of Division Two at the first attempt. We were very lucky with injuries up until about five games to go when Castle Aargh, Giving It Eyebrows, Baba Yogurt and Jesus Speedos all got injured in the same game and the rest of the team panicked about being on the cusp of something and fell apart mentally. So we ended up backing into second place off a really sporadic and unpredictable run through the end of the fixtures. The game against Cottbus probably sealed it for us, but was one of the most frustrating games as we scored on three minutes and then Cottbus had a player sent off on 8 minutes... and then we went from 1-0 up to 2-1 down by halftime against ten men. Fourth string striker Sharon Trilogy rescued us with two second half goals and that may have been the only useful thing he did in three years on the team. In the final game goal difference was protecting us to the extent that if we lost 0-5 Union Berlin would need to win 5-0 to bump us out, but fortunately they screwed up their final game, drawing at home to Aalen. The bad news is that we lost both Twelve Foot Pizza and Red Sonja to free transfers as we couldn't get near to their wage demands to extend their contracts. Worse, we then also lost Castle Aargh. He set a single-season scoring record for us with 25 goals and won the second division's top scorer award, but then in the gap between promotion and all the money showing up he demanded an improved contract and we didn't have the cash. 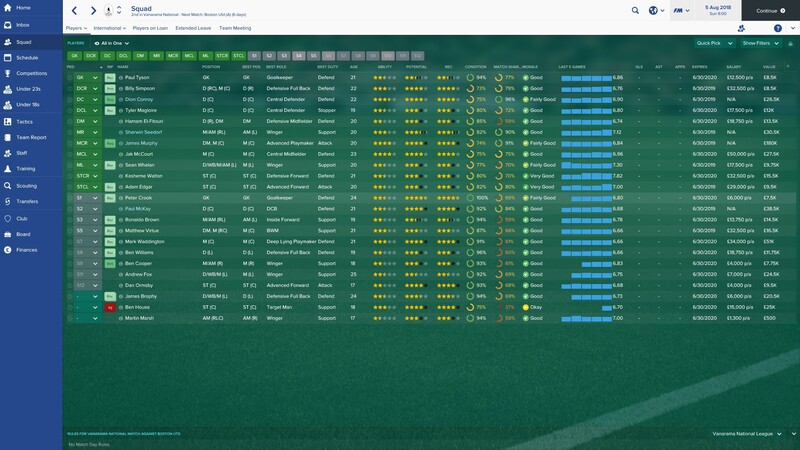 We had him locked into a contract until 2020, but he said he wasn't going to play and didn't think he could work with me, so we had to shop him around, which is where we get to worse² news - the team that showed up with the money was Hertha BSC who won the second division and beat us twice. They paid €3,500,000 for Aargh, which is a lot more than the €0 we paid for him, but after beating us home and away and then stealing Aargh it's pretty clear who my new nemesis is. 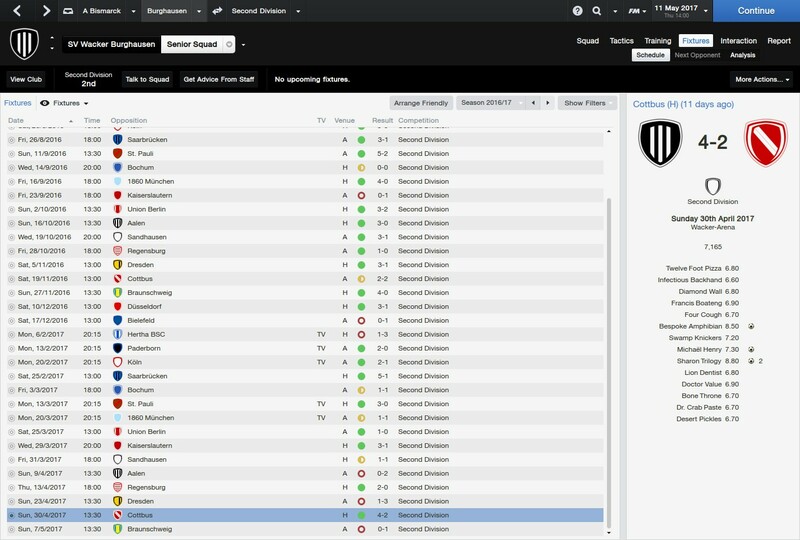 Congrats on successive promotions Bismark, and welcome to top of German football! Great work! With all the losses of key players, it looks like next season will be a challenge. How's your finances? Have you got money to get new players? The magic runs out on us in a big way in October. Things start out fine enough, with a strong 4-2 win at home followed by a 1-1 draw to extend our unbeaten stretch to 13 games. Unfortunately, that would be the last league point and the last league goal we get in in the month. We get shut out in our next three matches, all away, to drop to 6th place in the table. We now sit 9 points out of first and 4 points out of the playoff zone. The only highlight during the back half of the month was a 3-0 win in our first game of the FA Cup. A big reason for our drab performance may be midfielder Josh Murphy's groin, which he pulled in our first loss. He's been brilliant for us, but without his playmaking our offense just can't seem to find the net. Fortunately, he'll miss only one or two more matches. 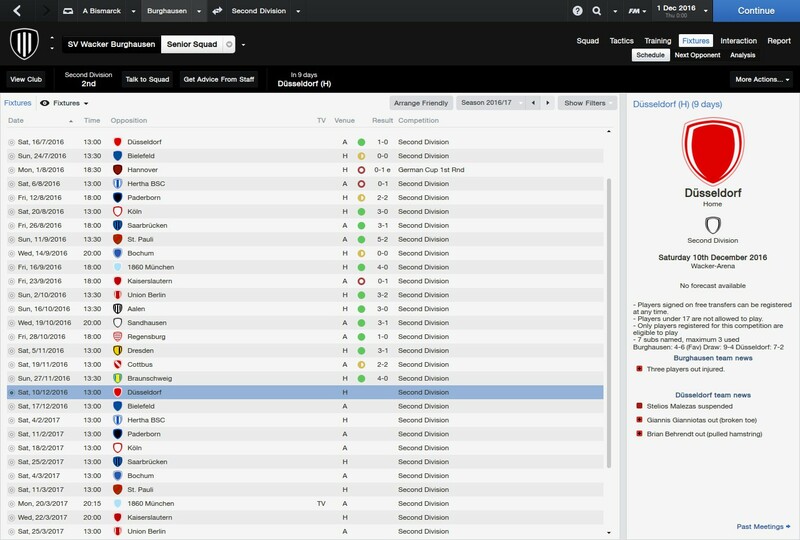 It's also not helping my morale that I made what is arguably my worst signing so far at Telford. With our best central defender out with an injury and a thin bench, I panicked and signed what looked like a great replacement for 46.5k per year for two years. Our scouts said he was fantastic and I was thrilled to land him. Once he showed up, however, all his ratings were much lower. What the heck? We essentially made a reserve defender our second highest paid player. The board is not happy, calling the move "a very poor deal". I agree. I am swamp scum. As the weather turns colder and we grind into November, we've got to find a way to start scoring again. We led the league in offense through 13 games, but since then nothing has gone in. How's your finances? Have you got money to get new players? This is a great question, because I've spent so long running with other people's cast offs that I forgot I could spend actual money now! My budget right now is €5,000,000 because you get €11,000,000 just in TV money for being in the Bundesliga. That's exactly the same amount as I got in total prizes for finishing second in division two. If I finish rock bottom of the top division I should earn a total of about €29,000,000! We won the FA Trophy! 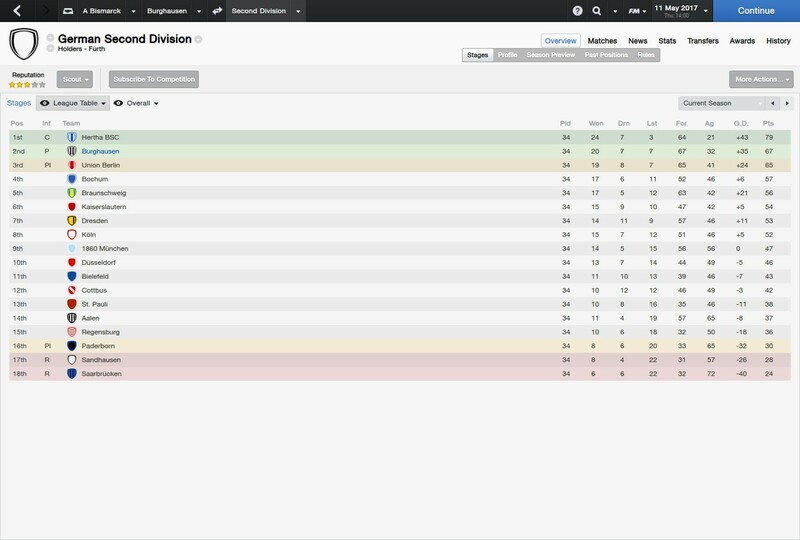 Finished 7th in the National League North as well. Our 21-year-old striker, a signing on a free (of course) was our star, scoring 28 goals in all competitions, 7 goals in our cup run including two goals in our 3-1 victory over Guiseley to notch the biggest trophy Worcester has ever had. I immediately tried to turn this success into a new job (this is a journeyman game, anyway), and was actually given interviews with clubs as big as AS Nancy, who had just been relegated from Ligue 1. We got no jobs, of course. Oh, and that FA Cup run? Well, after that historic win vs. Tottenham, we drew Cardiff at Cardiff City Stadium and got absolutely trounced 4-0. Not that I'm sad, a non-league team in the 4th round of the FA Cup is pretty impressive. It's the offseason now, and I think we've strengthened enough (our central defense was, by far, our biggest problem last season) so I'm hoping either promotion or a new job is on the cards.